Most cosmetics contain toxic chemicals that can cause harm and age you prematurely. They may look good and smell good, but underneath the facade of that beautiful packaging, those harsh chemicals are causing your skin to age faster than you ever imagined! Why use toxic cosmetics, many of which were tested on animals, when you can have your makeup and eat it too? You can make everything in your makeup bag from items you already have in your kitchen and some from your local health food store. The effects of makeup on your health are more than just skin-deep. Your makeup bag harbors more horrors than you can shake a sharp stick at: everything from lead to asbestos and quite a few nasty things in between. Some of the ingredients moonlight as stabilizers for pesticides and industrial cleaners. I think we all agree that something that’s used to clean a factory floor probably shouldn't be cleaning your delicate face? These endocrine disruptors found in synthetic fragrances and nail polish have been linked to breast cancer and early puberty in girls. Studies have also found high phthalate levels in people suffering from diabetes. Phthalates have been linked to obesity in children. Used as an anti-microbial, anti-fungal, and as a preservative, parabens have been found in biopsies of breast tumors. Parabens are in 75-90 percent of cosmetic products! The problem is that these are considered part of the “trade secret” ingredients, so cosmetic companies aren’t required to list them on the label. They are found in a wide range of creams, lotions, and antiperspirants. 4. LeadFound in a plethora of products, including sunscreens, lipsticks, foundations, nail polishes, and toothpastes with whitening properties, lead is a neurotoxin that is known to reduce fertility and may result in learning and language disabilities and behavioral problems. A popular anti-bacterial, triclosan can be found in cleansers, antiperspirants, cosmetics, and toothpastes. Triclosan is actually classified as a pesticide, and it can have serious effects on your hormones, especially those associated with the thyroid, which regulate the metabolism. Widespread use of triclosan in hand sanitizers and anti-bacterial soaps is linked to increased bacterial resistance. Antiperspirant contains anti-bacterial chemicals and zinc, which are linked to breast cancer and early-onset Alzheimer’s disease. So why not toss your underarm sticks and make your own? You probably already have everything you need! Mix all the ingredients into a stiff paste and spoon into an empty underarm deodorant stick. Cool in the fridge until firm. Apply as usual. *Note: if it is very warm in your home, keep the deodorant in the fridge so that the coconut oil doesn’t liquefy. 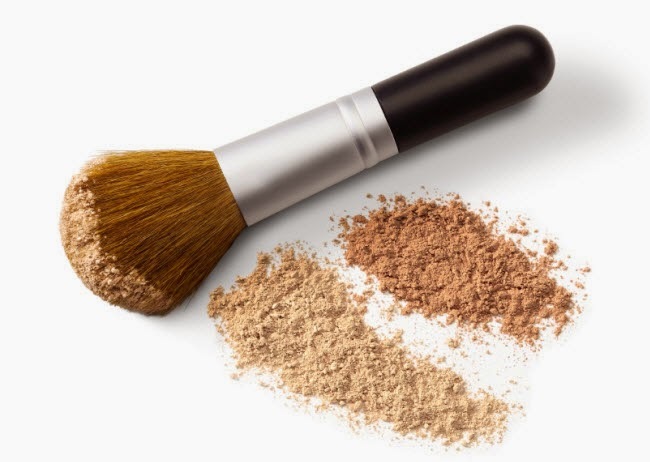 Talc, a known toxic substance, is found in face powders and eye shadows, where it acts as an anti-caking agent. Talc contains asbestos, which causes cancer in the breast and lungs. For face powder, start with one tablespoon of arrowroot and slowly add cocoa and nutmeg until you get a shade that matches your skin tone. Place the beeswax, coconut oil, shea butter, and aloe vera in a double boiler. If you don’t have a double boiler, place the ingredients in a glass or metal bowl in a pot of water. If you don't have a funnel, pour the mixture into a plastic bag, snip a corner off, and then squeeze the bag so that the mixture can be piped into the mascara tube without spilling. For more information on DIY's info graphics and more, please visit: http://www.fix.com/blog/diy-organic-makeup/. Original Article by: Nikki Fotheringham from FIX.